You are here: Home / Blog / math / How Do Visual-Spatial Skills Influence Math Skills? Did you know that a student’s visual-spatial skills influence math skills? Visual-spatial skills provide us with the ability to visually perceive two or more objects in relation to each other and to yourself. Visual spatial relationships are important in everyday tasks. You need to interpret what it means to “stand first in a line”, “sit in front of Johnny” or “put the pencil on top of the paper”. If you have difficulty perceiving spatial relationships it can effect your motor skills, body awareness, problem solving, activities of daily living and your overall performance in school. 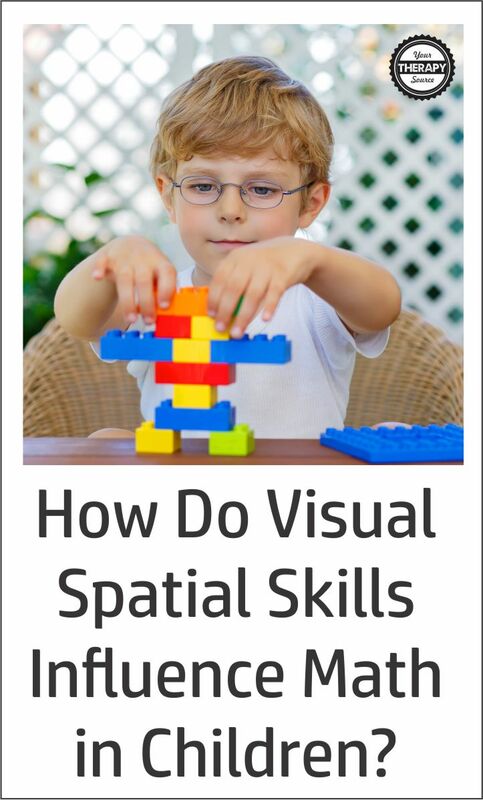 Researchers are also finding that visual spatial skills influence math skills. Researchers hypothesize that mathematical thinking is supported by spatial representation. In order for children to solve math problems, they use strategies that involve mental number lines, geometric figures, and information about locations in space. People who use spatial representation (including spatial relationships) in math problems are more likely to get those problems correct. Visual-spatial working memory is the ability to hold the locations of different objects, landmarks etc. in working memory. This skill has been shown to be beneficial when solving addition problems that require carrying. One theory indicates that visual-spatial working memory is a foundational cognitive skill for supporting early numeracy knowledge, which then supports later math achievement. There is a significant amount of evidence that supports the notion that visual spatial skills are linked to individual differences in math abilities. Children who have better spatial skills when compared to their peers have better math skills. Visual-spatial working memory, form perception, and spatial visualization are all have been shown to be predictors of math skills in school-aged children. In addition, before school-age, spatial assembly skill has been shown to be predictive of math skills. Even at the infant level, visual-spatial skills can predict math abilities at age 4. One study showed that visual-spatial skills at age 3 were predictive of math knowledge even two years later after controlling for earlier math knowledge and executive function skills. Visual-spatial working memory at age 4.5 was also able to predict math achievement through Grade 3. Another preschool study indicated that patterning and spatial skills predicted math knowledge at the beginning and end of preschool. The researchers recommended that standards for early math should include pattern and spatial skills. Does Working on Visual-Spatial Skills Improve Math Skills? The evidence is mixed on whether working on spatial skills leads to improvements in math knowledge. There are three studies that did indicate that improving visual-spatial skills in children resulted in increased performance on math assessments although 2 other studies did not see a difference in math skills. 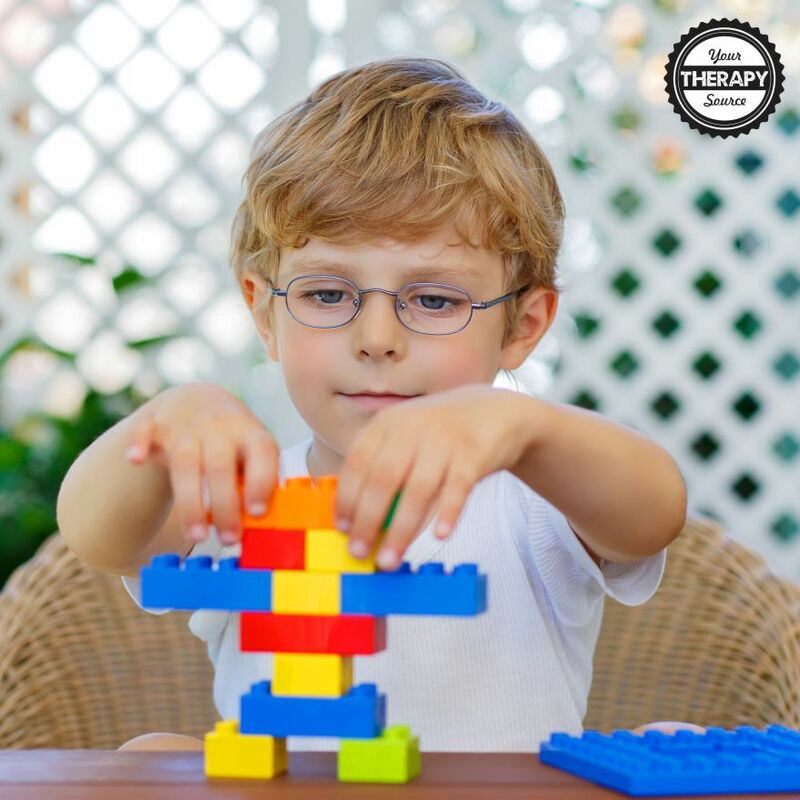 Researchers recommend that children experience playing with blocks, puzzles, video games and other spatial materials to help develop their spatial skills. Through scaffolding teachers and parents can help by using techniques such as teacher-guided block play in which children are asked to build structures with specific constraints and are asked to change their designs in specific ways. Rittle-Johnson, B., Zippert, E. L., & Boice, K. L. (2019). The roles of patterning and spatial skills in early mathematics development. Early Childhood Research Quarterly, 46, 166-178. Physical Activity and Walking in Children with Cerebral Palsy Over Time Physical Inactivity in Youth – It starts younger than you think!